This research is the result of a conversation with @RobVollmanNHL and looks at the last couple of NHL season for icing committed by teams, players and coaches. I’m no expert by any means on hockey, but generally speaking an icing is a negative event; icing tires out the team, it allows the opposing team to change their lineup and pick their preferred match-ups, and the face-off following icing is in the defensive zone of the icing team, with a roughly 50% change of regaining possesion of the puck (and thus a 50% chance of giving the puck to your opponent in their attacking zone). A first step in this research showed me what players iced the puck most, and I then aggregated that data per team. It made me wonder what the influence of the coach was on these icing tendiencies; do some prefer the temporary relief that icing can provide over the potentially negative consequences described above? Does it just come with a certain playing style coaches prefer? To do this anlysis I needed data for icing events, which team committed the icing, what players were on the ice, and who was coaching that team. For the icing events I use the R package NHLscrapr from A.C. Thomas and Samuel L. Ventura (link) to pull play-by-play data from the NHL’s HTML reports per game (example). This gives me the events per game(-number), the players on ice for each team, the teams, and to a certain degree the team that iced the puck (more to follow below). Still missing were the coaches of the teams for which I used different R-code that reads the NHL API Life Feed JSON files (example) and pulls both coaches and the game number, which can be linked to the data described above. The R-code used for the data extraction described above can be found here and here. I should note that to my knowledge it is impossible to determine for every icing which team iced the puck; the icing team can not be determined when the “homezone” field contained other values then “Def” or “Off” (like “”, “Neu” and “Unk”). Checking on a subset of all data I found about 1% of the data contained these values, and were excluded from the research as they could not be assigned to a team or player. identify and assign the icing players on the ice (“committing” the icing) and the ones… uhm… “forcing” the icing? The icing events can be filtered easily through the etype column: etype = “ICING”. It also shows which players were on the ice, and in 99% of the cases the homezone column will specify “Off” or “Def”. Assuming this means the zone for the hometeam where the puck was iced from (as in “passed from before it crossed the red goal line”), we can determine what team (but not which player) iced the puck. To confirm the assumption let’s look at the image of the report and the underlying data. After 5 seconds in the game an icing happens (report) in homezone “Off” (data). Since this game is in Ottowa (report) the icing is “passed from” Ottowa’s offensive zone (data). The following faceoff is won by Toronto in their defensive zone (report), recorded as “Off” in the homezone column (data). This makes sense, as Toronto iced the puck from their own zone, Ottawa’s offensive zone, leading to a faceoff in Toronto’s defenisive, Ottoawa’s offensive zone. 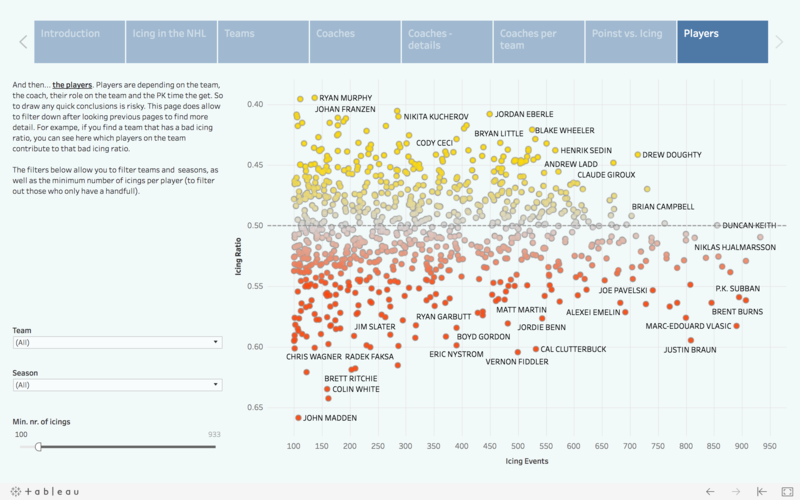 Now I have a ll the data I need to work on visualization in Tableau. 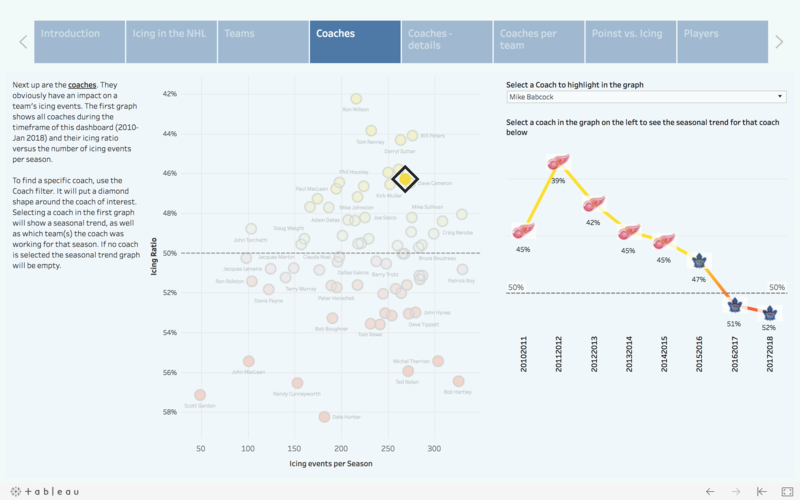 The coaches icing data can be used to show counts for icing events at a team or league level, but needs to be divided by 2. As there is a record for every coach, an icing event will be added once to the coach of the icing team, and once to the coach of the iced team. We don’t want to double count. 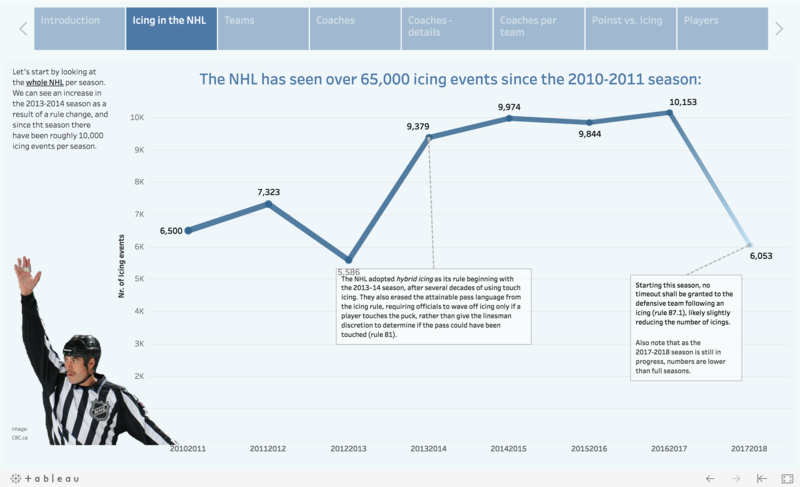 A similar situation applies to the player icings, but as there are a changing number of players on the ice for every icing event, it would be a lot harder to use for anything other than player counts than the coaching data. I want to show icing event in context; counts are not particularly interesting as they depend on so many other factors. Icings per game would be more useful, and icing events per team per all icing events in a game, per game would be even more valuable. At a player level showing icing events per 60 min. would add more depth, and this is something I plan looking into at a later stage. 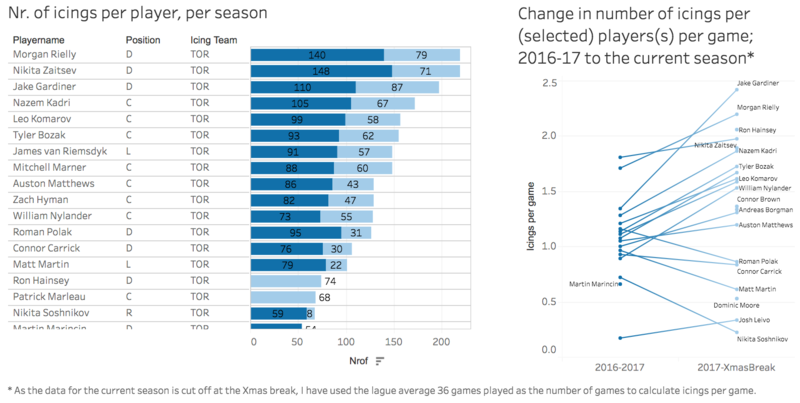 One more thing I added is a table of season points per team, based on standings pages at https://www.hockey-reference.com/leagues/NHL_2017_standings.html, which allowes me to look at the relationship (if existing) between a team’s points in a season and the icing ratios and number of icings. With the data being well prepared the work in Tableau Public was mostly aestetic, only creating a few parameters and calculated fields for an improved user experience. I used the Story feature, which makes the whole dashboard more like a err… story. I hope you enjoy it.